Two fathers, a son, two bullies and a paper plane competition form a wonderful read about friendship, loss, grief and letting go. This is a film tie-in set in Western Australia, and currently screening at the cinemas. Dylan’s mother has recently died and he misses her badly. His loss is accentuated by his father’s withdrawal into his own grief. 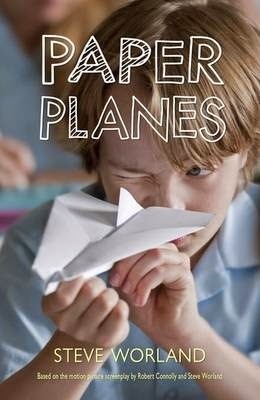 Dylan finds a way to occupy himself with something other than his loss when a visiting teacher challenges the class to make paper planes, and enter the Australian Junior Paper Plane Championship. This brings great change to Dylan’s life as he strives to coax his father back to life. Always optimistic but lonely and neglected, Dylan has turned to his grandpa who is living life to the fullest in a retirement village. He’s a character; lovable but a bit crazy, who sees life as a game of exciting challenges to be faced without fear. He teaches Dylan how to be fearless too. And he is. He stands up to bully Kevin who becomes his mate, and then faces up to Jason, another bully, determined to win at any cost. But it’s his father’s love he wants back. This is a moving book full of challenges and changes; courage and release, perseverance, and the relationship between a father and son. Paper Planes doesn’t end there. It contains additional information about folding paper planes, a Q & A with the director Robert Connolly, photos from the film, a list of the main cast in pictures, a note from the Paper Pilots, Dylan Parker and James Norton, and how they came to be part of the paper plane project, and tips and tricks on how to design, fold and throw paper planes. There are also seven pages of folding instructions in text and diagrams, and four pages with perhaps unknown facts about paper planes. Overall, it’s a carefully considered publication that I found highly interesting and entertaining. Thank you for your review of Paper Planes. We are studying the novel in class and think that your review was very informative. It is very fascinating to read about the characters, in particular, how Dylan tries to help his Dad by entering the contest and getting him excited about life again. We are looking forward to reading the book and also checking out information on how to make paper planes.